A diverse panel of experts on the creation, distribution and consumption of digital information will participate in a symposium at California State University, Northridge on Wednesday, April 3. The event, which is hosted by the Oviatt Library and Academic Affairs, will take place from 9:30 a.m. to 4 p.m. in the Jack and Florence Ferman Presentation Room of the Delmar T. Oviatt Library. 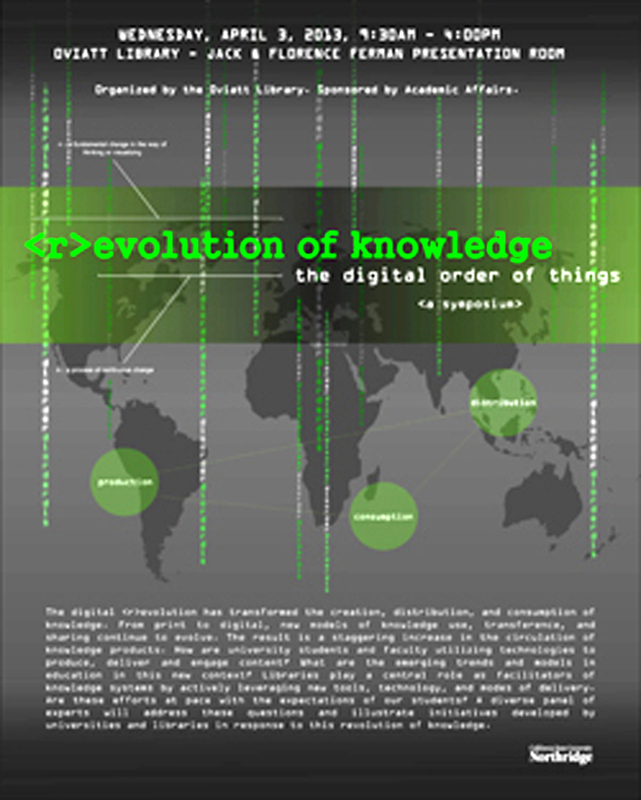 The symposium, entitled “<R>Evolution of Knowledge: The Digital Order of Things,” will address several issues, including how university students and faculty utilize technology to produce, deliver and engage content; the emerging trends and models in education in the new digital age; and the role of libraries in meeting the expectations of students in light of constant technological changes. CSUN President Dianne F. Harrison, Provost Harry Hellenbrand and Oviatt Library Dean Mark Stover will be among those scheduled to address attendees. Guest speakers include Marshall Breeding, a consultant, author and creator of “Library Technology Guides”; Stephen Abram, managing principal at Lighthouse Partners and affiliate of Dysart and Jones Associates; Jeff Gold, director of Academic Technology at the CSU Chancellor’s Office; Deone Zell, senior director of Academic Technology at CSUN and Chrysanne Lowe, vice president of Global Marketing Communications at Elsevier. The event will include lunch. RSVP by March 28 to mickey.martinez@csun.edu. For more information, call (818) 677-2271.